On a Mac? 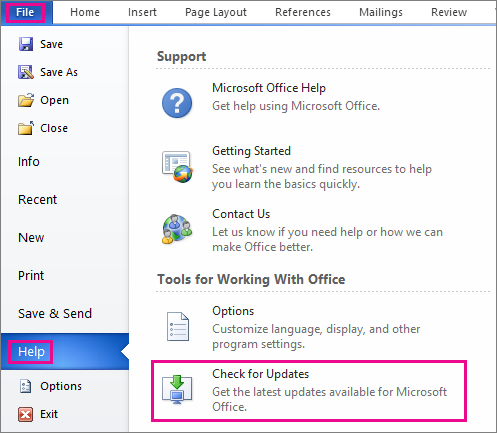 See Check for Office for Mac updates automatically. Click here for the Latest updates for versions of Office that use Windows Installer (MSI). Note: You may need to click Enable Updates first if you don't see the Update Now option right away. 4. Close the "You're up to date!" window after Office is done checking for and installing updates. If you purchased Officefrom the Microsoft Store app on your Windows device, you can update Office from the same place! Open the Microsoft Store app by typing "Microsoft Store" into the taskbar search and press Enter. Click on the icon and make sure you're signed into the Microsoft account associated with your Office license. Click on the icon > choose Downloads and Updates. Note: If you get a "You're good to go" message after clicking Get Updates, you don't have any new updates to install. If Update Options is missing and there's only the About button, you either have a volume license install or your company is using Group Policy to manage Office updates. Try Microsoft Update or contact your company help desk. 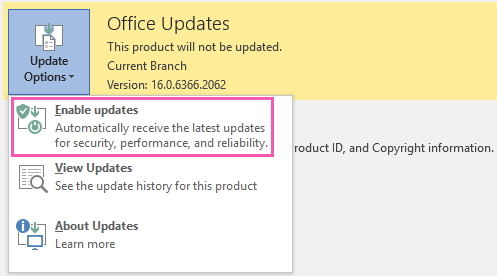 To download an update manually, see Office Updates. Find and select your version of Microsoft Office on your computer. In the bar above, click Change. Select Quick Repair > Repair. If this does not work, retry the steps, but choose Online Repair instead. If you are still unable to open any apps, uninstall and reinstall Office. 1. Open any Office 2013 application, such as Word and create a new document. 2. Click File > Account (or Office Account if you opened Outlook 2013). 3. Under Product Information, choose Update Options. Watch these steps in a video. 4. Click Enable Updates if the option is available. 5. 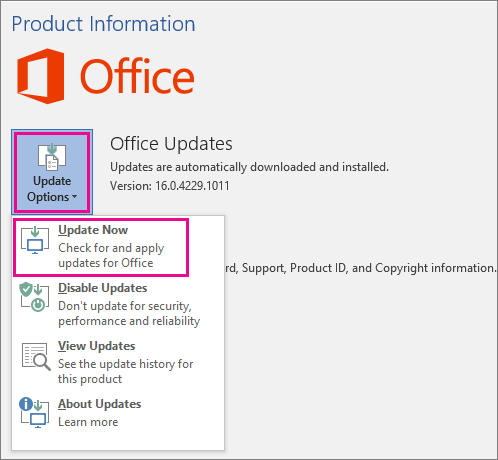 Choose Update Now to manually check for and install Office updates. 6. Close the "You're up to date!" window after Office is done checking for and installing updates. If Update Options is missing under Product Information, and the About button is the only option available, you either have a volume license or your company is using Group Policy to manage Office updates. Try Microsoft Update to get the latest updates or contact your company help desk. If you would like to update Office but can't open any of your Office apps, try repairing your Office suite. Open any Office 2010 application, such as Word 2010 and create a document. Go to File > Help > Check for Updates. Choose Install Updates or Check for Updates. If neither option is available, follow the additional steps provided in the pop-up window that appeared after you chose Check for Updates. If the Update option is missing or you're unable to update, try Microsoft Update to install your Office updates through Windows. Thank you for using Office 2007. If you are looking for updates, Support has ended for Office 2007. To use the newest features and get the most up-to-date security updates, we recommend you get the latest version of Office. Thank you for using Office 2003. If you are looking for updates, Support has ended for Office 2003. When do I get the newest features for Office 365?